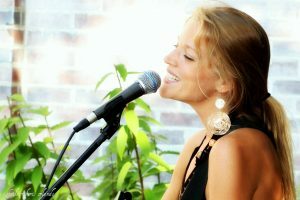 A seasoned musician and performer with experience in a variety of musical contexts, instruments, and genres, Marina offers private and group lessons in voice, guitar, and songwriting to aspiring musicians with a range of musical experience and goals. Whether you are a fledgling guitarist picking up the instrument for the very first time, an experienced vocalist looking to refine your live performance, a budding songwriter, or any combination thereof, Marina’s expertise — earned over many years in the classroom, on the road, on the stage, and in the studio — can help you achieve your goals and grow as a musician. Marina began studying music at a young age, taking lessons in violin, clarinet, voice, and guitar and participating in bands, choirs, a-cappella groups, and musical theater. As a teenager, she began performing professionally in a jazz duo. The jazz inflections she honed in her voice became a trademark of her sultry sound as she evolved from jazz chanteuse to singer/songwriter while pursuing a degree in music in New York City. Since then Evans has written and released 3 EPs and a full length album to critical acclaim, and has toured across the U.S. and in Europe. Her unique sound and powerful stage presence have earned her opening sets for such folk legends as Judy Collins, Jonathan Edwards, and Maria Muldaur, numerous radio placements, as well as two nominations for Female Performer of the Year at the New England Music Awards. Currently dividing her time between her home of Cape Ann, MA, and her adopted home of Florence, Italy, Marina is working on her second album, Tide & Stars, set to be released in the spring of 2017.